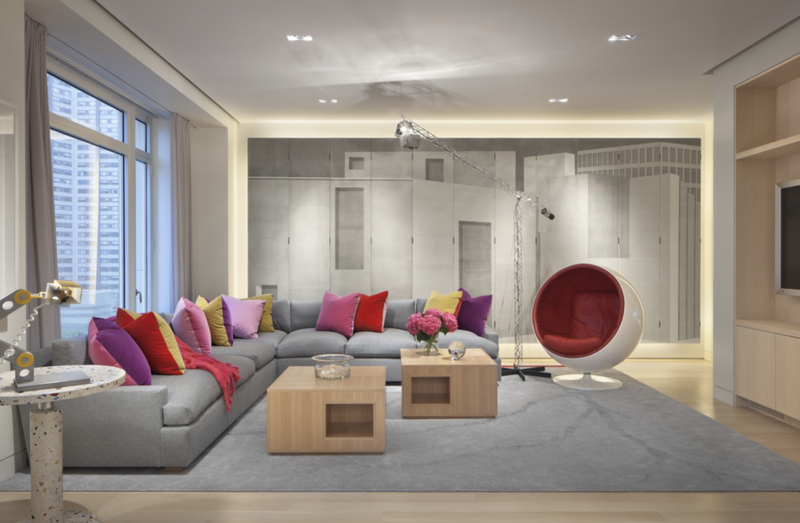 The juxtaposition between linear and circular forms is brilliantly explored in this penthouse duplex that runs through the entire floor of a newly constructed iconic limestone building on Manhattan’s Central Park West, in a collaborative project with architect Shelton Mindel. 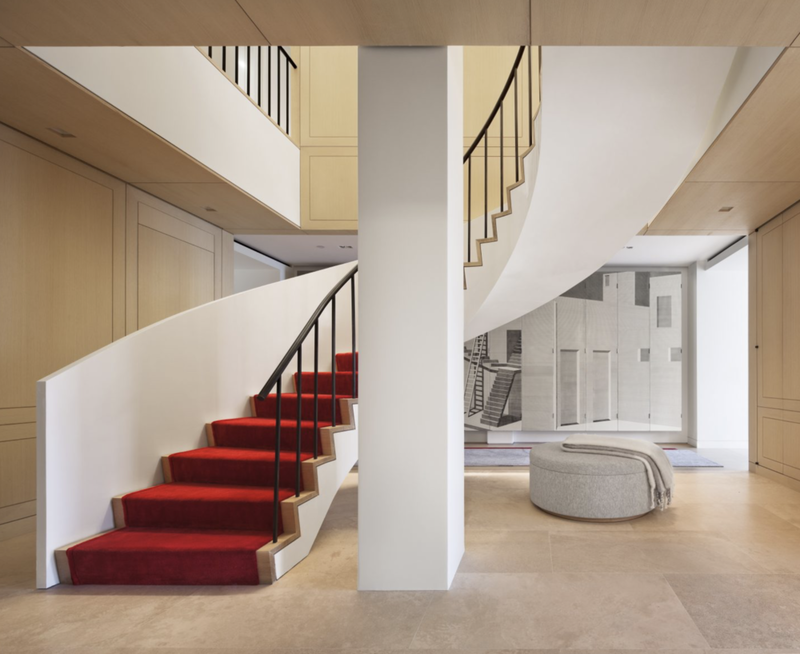 In the entry hall, a circular staircase encased in plaster winds upward into the private living areas on the upper level, which creates a pleasing contrast, centered and framed as it is against compartmentalized wood panelling that surrounds the room. Rich oakwood walls and ceilings envelop the library and circulatory space that comprises the centralized core of the unit. Flanking this serene literary space are open living areas that are flooded with natural light from the East and West, and expansive views of Central Park show an expansive leafy verdure that terminates in a horizon of skyscrapers, giving the view a thoughtful tone of urban sophistication that meets the serenity of nature. 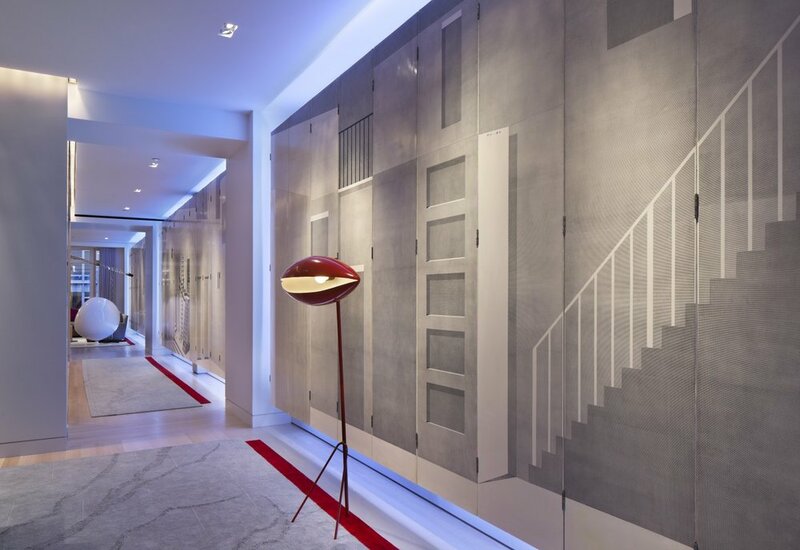 The interior fixtures of the living room hearth and doors echo the limestone exterior of the building, and an art gallery features a prominent floor to ceiling masterpiece of Piero Fornasetti, a thirty-two panel screen entitled la stanza meta sica, backlit by recessed lighting that can change colors to accompany the tone of the interior.